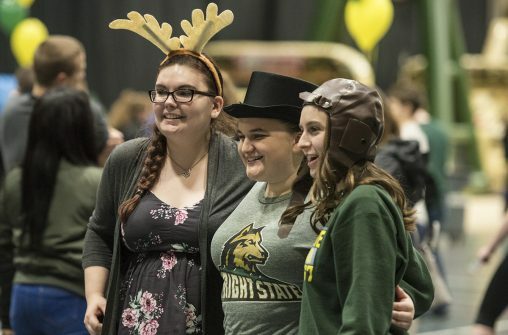 Raider fans can show their Wright State spirit at the annual Raider Roundup pep rally, which takes place before the men’s basketball team’s pivotal game against North Kentucky on Friday, Feb. 15. Raider Roundup begins at 7:30 p.m. in the Wright State Nutter Center’s McLin Gym. The game tips off at 9 p.m. in the Nutter Center. Fans are encouraged to wear black. Holley Mapel, a senior marketing major, said Raider Roundup has been a tradition for as long as she can remember. It is a time for students to get together and encourage the team and each other before a game. Raider Roundup is led by The ’67 Society, which has a focus on university pride and tradition in addition to philanthropy and alumni engagement. Several other student organizations and campus departments are collaborating in the event, including the University Activities Board as part of iHeartWSU week. At the pep rally, students can use a photo booth with props, make signs and get face paint or body paint. ROTC will provide inflatables, including an obstacle course, and the Athletics department will give away free T-shirts. 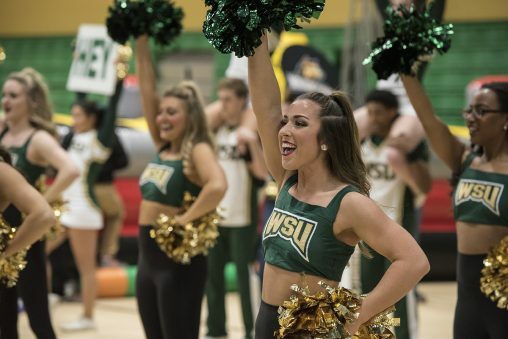 The event will also include performances by the Wright State show choir Surround Sound, the Emerald Jazz Dance Group and the Wright State Pep Band. Rowdy will also be there. Mapel encourages students to attend Raider Roundup, especially if they have not been to a basketball game before. Raider Ride, Wright State’s shuttle service, will work extended hours to transport students to and from the game. It will run for 7 p.m. to midnight so students can park on campus and take the shuttle to the Nutter Center. Since the game will be broadcast on ESPN U, Wright State wants to ensure the Nutter Center is packed with Raider fans. Mapel said students might even get the chance to appear on TV.